If you haven’t cottoned on yet we’re saying the 80 Titanium seems to share a lot of aesthetical similarities to a certain iPad mini. 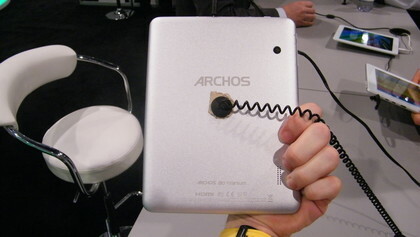 The large Archos logo splashed across the front, coupled with the front facing camera hiding in the top corner is apparently enough to keep the lawyers at bay, with the firm not worried about a potential battle with Apple. While there may not be much between the two design wise, when it comes to price the Archos is the clear winner setting you back just £149/$169 (around AU$225). Wrapped up in an aluminium chassis the 80 Titanium is a solid tablet, although it doesn’t feel as premium as the more slender and higher quality iPad mini – but considering its price that’s no surprise. 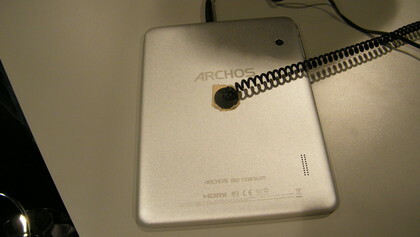 The Archos 80 Titanium has an array of ports along the top including a microSD slot, power socket, miniHDMI, microUSB and 3.5mm headphone jack, ensuring you’re never caught short when it comes to linking the tablet to other devices. On the right hand side you’ll find the power/lock and volume rocker switches, both of which are made from cheap plastic, bringing down the overall look and feel of the 80 Titanium. 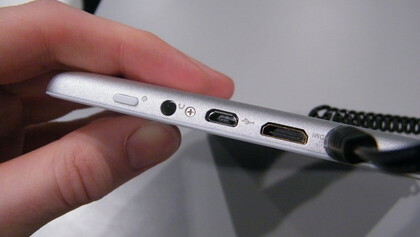 Oddly there’s an additional button on the top alongside all the various ports – a physical Android home key. We’re not sure when you’d need this button, as the traditional Android menu keys are always on the screen and when we asked at the Archos booth they were as unsure of it as we – speculating the button may not make it to the final product. 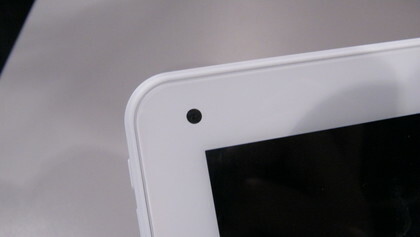 The 8-inch 1024×768 IPS display offers up decent viewing angles and appears to be bright and clear, although on closer inspection it is not as detailed as the 7-inch screens found on the Google Nexus 7 and Amazon Kindle Fire HD. On screen you’ll find the pure Android Jelly Bean operating system with Archos choosing not to apply any overlay and we’re glad it didn’t as we’re big fans of Jelly Bean. Running the show is a 1.6GHz dual-core processor and a quad-core GPU which means the 80 Titanium has plenty of grunt under the hood. 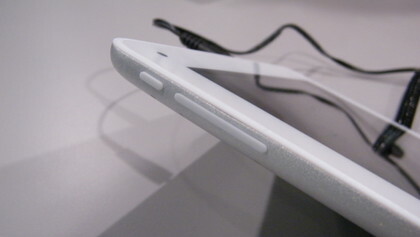 While the Android experience on the 80 Titanium is pretty slick it lacks the beautiful fluidity found on the Nexus 7. 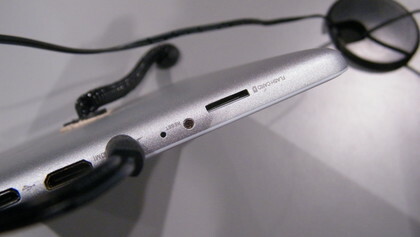 The 80 Titanium we got hands on with at CES 2013 was still running a development build, so speed may be increased in the final product, although it’s difficult to tell at this time. 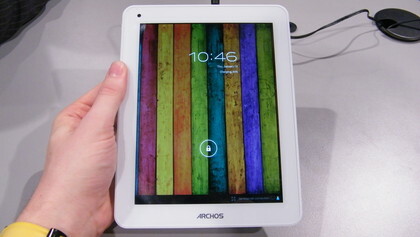 Slightly disappointingly you’ll only be able to pick up the Archos 80 Titanium in an 8GB, Wi-Fi only variant with no sign of larger sizes or 3G connectivity on the horizon. This limits the tablet in terms of the amount of content it can hold, and while you can slip a microSD card in to boost the storage 8GB still seems a bit short in our book. Round the back you get a relatively average 2MP camera allowing you to take some quick snaps, but it certainly won’t produce anything award winning. 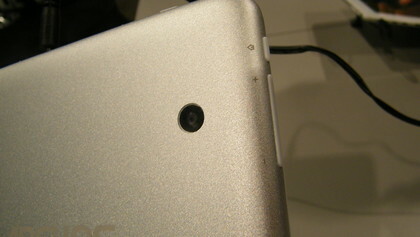 On the front the camera located in the corner is of VGA quality, reserved for video calling and not a lot else. As the 80 Titanium is running an unadulterated version of Android JellyBean you’re treated to Google’s stock camera app, giving you a simple and intuitive interface for taking photos. Shutter response was reasonable, but once again the 80 Titanium didn’t blow us away with blistering speed or incredible quality. 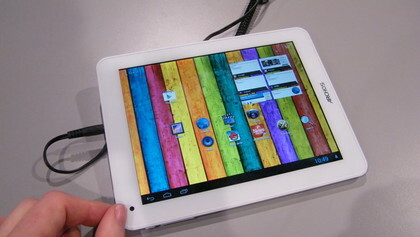 The Archos 80 Titanium is a pretty pedestrian tablet when you stack it up against its competition, but with its attractive price it could well be a silent success in the family market. 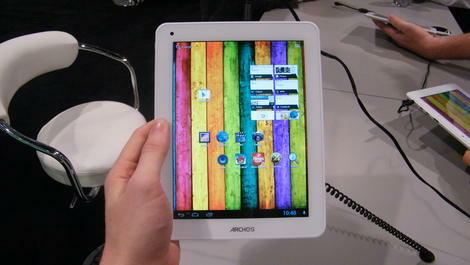 It manages to deliver a solid Android tablet experience without doing anything particularly amazing or heading turning. If you’re looking for a sub-£200/$200 slate then the Archos 80 Titanium isn’t bad but for a little extra cash you’ll be able to get the better Google Nexus 7, although that has a slightly smaller screen. An iPad mini killer it is not, but for someone who wants one and doesn’t have the cash flow to fund such an extravagance the 80 Titanium could fit the bill nicely.